Ever wonder what it’s like to work with an Instagram #superstar? If you’re asking us, we actually know! We get to work alongside Kate O., creator of The Fancy Pants Report and girl in front of the camera @kateogata. Every time we feel like we need some outfit inspo, we get a sneak peek at her look of the day and sometimes, if we’re lucky, get her input on our Fixes. 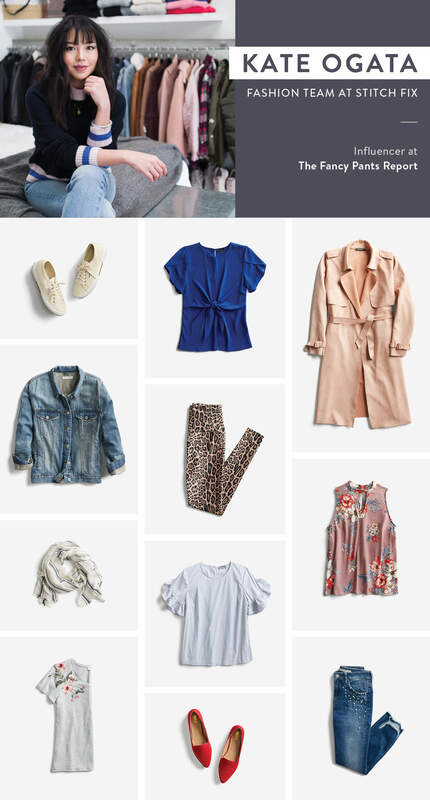 Ready to see what Kate’s picks are from Stitch Fix? Keep reading! Long Layers: Whenever I’m having a “nothing-to-wear” moment, my go-to outfit consists of a tee, jeans, and a long cardigan or trench coat. This trusted closet staple can transform any casual look into a polished one. Bright Blouses: The easiest way to jumpstart your morning? Throw on a vibrant hue. A saturated hue like cobalt or fuschia can seamlessly transition from spring to summer. Try them with white jeans or linen trousers. Spring-To-Summer Sneakers: I wear sneakers 75% of the week. Whether it’s a with a dress or jeans, a simple low-top style can replace any sandal or flat. Light Wash Denim: Brighten up your spring #OOTDs with light-wash denim in a straight or boyfriend cut. I opt for cropped silhouettes that hit above or at the ankles for the most flattering silhouette. Printed Leggings: For days when you can’t even, leggings can save the day. Shake up your basic black with a printed pair instead. If leopard is too much, try something more subtle like marble print or a shiny solid (I got both of these in recent Fixes)! Classic Flats: When sneakers feel a bit too casual, I throw on a pair of pointed flats. If you find ballet flats uncomfortable, try a loafer instead — the “upper” part of the shoe covers more surface area alleviating some of the pressure on your toes. Denim Jacket: Running out the door? Top off any spring outfit with a jean jacket. For a more trend-forward feel, look for an oversized or cropped version. Embellished Tee: Give your average tee and jeans look a boost with an embroidered or graphic twist. It’s an easy way to incorporate pattern and color to your most casual outfits. Button-Up Shirt: A breezy, lightweight button-up shirt will be your favorite springtime staple. Tie the ends together for a retro feel or wear it open over a graphic tee (see #8!) for a laidback, cool girl vibe. Floral Top: Florals for spring? Groundbreaking. No really! Switch out your stripes with this flirty pattern or dabble into print mixing by paring them together. Do you want to see some of Kate’s picks in your next Fix? Update your Fix Note or schedule a Fix and tell your Stylist!